Back before the internet age, Nancy Hampton eagerly anticipated her print subscriptions from International Living, so she’d clearly fostered a dream to live overseas for a long time. In the 1990s, she and her husband Luther, managed to garner some good work gigs in Germany; Nancy as a graphic artist and Luther in IT. They loved immersing themselves in a new culture. The regal town, named for Prince Umberto, sits along the Tiber; it has about 16,000 residents and a tangle of streets in the compact historic center. 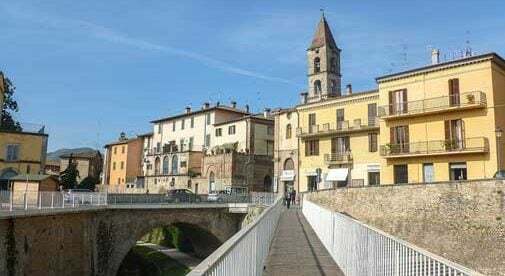 While it’s a rather small town, it has a beautiful castle, an active community, and some headliner Renaissance art that includes Pomarancio, Pinturicchio, and Signorelli. It’s also a good location for touring around, and for access to the airports in Perugia and Rome for trips around Italy and Europe. Since winter can be damp and dreary, that is when they usually visit other cities. They also like to go for a walk along the Tiber River, take a drive into Tuscany or other parts of Umbria, or go visit a winery. Travel around Europe is within geographic and financial reach, too, with low-cost airlines offering easy flights. Europe’s rail system offers another choice for vacations. They recently hopped on a train to Venice for $60 each way. Umbria has been a good choice for the Hamptons, which they say has absolutely met the expectations they envisioned as they endured those last working years while planning for a retirement in Italy.